The fifth Triton (SSR(N)-586) was laid down on 29 May 1956 at Groton, Conn., by the Electric Boat Division of the General Dynamics Corp.; launched on 19 August 1958; sponsored by Mrs. John Will; and commissioned on 10 November 1959, Capt. Edward L. Beach in command. Triton put to sea on her shakedown cruise on 15 February 1960, bound for the South Atlantic. She arrived in the middle Atlantic off St. Peter and St. Paul Rocks on 24 February to commence a history-making voyage. Having remained submerged since her departure from the east coast, Triton continued on south towards Cape Horn, rounded the tip of South America, and headed west across the Pacific. After transiting the Philippine and Indonesian archipelagoes and crossing the Indian Ocean, she rounded the Cape of Good Hope and arrived off the St. Peter and Paul Rocks on 10 April-60 days and 21 hours after departing the mid-ocean landmark. Only once did her sail break the surface of the sea, when she transferred a sick sailor to Macon (CA-132) off Montevideo, Uruguay, on 6 March. She arrived back at Groton on 10 May, having completed the first submerged circumnavigation of the earth. 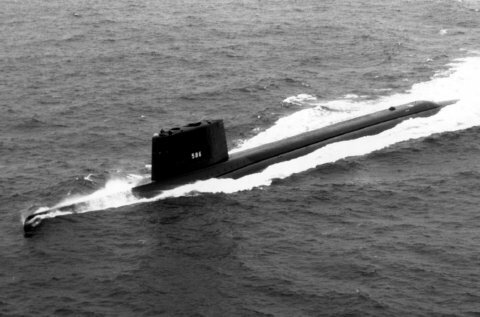 Following her post-shakedown availability, Triton assumed her duties as a radar picket submarine in August 1960. She was then deployed to northern European waters with the 2d Fleet to participate in NATO exercises oriented around detecting and intercepting Soviet bombers overflying the arctic. She finished the deployment with a port visit to Bremerhaven, West Germany. For the first half of 1961, Triton conducted operational patrols and training exercises with the Atlantic Fleet. During this period, the rising threat posed by Russian submarine forces increased the Navy's demands for nuclear-powered attack submarines with antisubmarine warfare (ASW) capability. Accordingly, upon the demise of the Navy's radar picket submarine program following the completion of the land-based Distant Early Warning (DEW) radar stations in Canada, Triton was redesignated SSN-586 on 1 March 1961 and entered the Portsmouth (N.H.) Naval Shipyard in June 1962 for conversion to an attack submarine. In March 1964, upon completion of this overhaul, Triton's home port was changed from New London, Conn., to Norfolk, Va. On 13 April 1964, Triton became the flagship for the Submarine Force, Atlantic Fleet, and served in that role until relieved by Ray (SSN-653) on 1 June 1967. Eleven days later, Triton was shifted to her original home port of New London. Because of cutbacks in defense spending, as well as the expense of operating her twin nuclear reactors, Triton's scheduled 1967 overhaul was cancelled indefinitely, and the submarine-along with 50 other vessels-was scheduled for inactivation. From October 1968 through May of 1969, the submarine underwent preservation and inactivation processes and was decommissioned on 3 May 1969, the first nuclear-powered submarine to do so. On the 6th, Triton departed New London under tow and proceeded to Norfolk where she was placed in the inactive fleet. Although stricken on 30 April 1986, she remained berthed at Norfolk until 1995 when she was towed to Bremerton, Wash., for disposal. The submarine moved into drydock at the Puget Sound Naval Shipyard in mid-2007 to commence scrapping under the Submarine Recycling Program.